Scientists have measured heat change across Europa's icy surface for the first time. Just because Jupiter's moon Europa is coated in ice doesn't mean all that ice is the same temperature. And now, scientists have mapped the hot and cold spots on the moon's surface using data gathered from Earth, with accuracy down to 125 miles (200 kilometers). While most of the temperature variations they measured can be explained by sunlight's influence on the ice, there's one unusually cold spot that is stumping the scientists behind the new research. That spot, which falls on the moon's northern hemisphere, stood out in images taken at different times of the day, which surprised the scientists. They weren't sure what might be causing the local coldness and didn't know of any geologic features there that could be responsible. Probably unrelated but nevertheless intriguing is a coincidence on the opposite side of the moon: an unusually warm area at Pwyll crater, which is one of the youngest impacts on the moon. That made more sense to the team, they wrote in their paper about the research, because scientists know that craters on other solar system bodies tend to retain heat compared to their surroundings. The measurements are based on data gathered by the Atacama Large Millimeter/submillimeter Array (ALMA), in Chile. Then, they compared those measurements with the temperatures predicted by a thermal model of the moon, which considers how much sunlight hits the world and how the icy surface reflects that light, based in part on observations made by the Voyager 2 spacecraft. Thermal images of Europa produced as part of the new research show a strangely cold region in the upper left corner of the upper left image. Over most of the moon's surface, the data and the model lined up well, except for Pwyll crater and the cold spot in the northern hemisphere. The scientists were also surprised to find that there didn't seem to be much connection between local geologic features and the temperature. The team wants to keep using ALMA to study surface temperatures on the moon in the hope of making their estimates more robust. 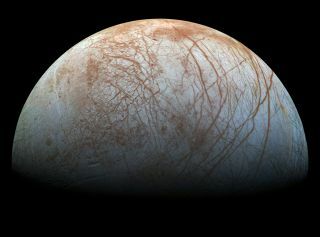 But there may not be much more they can do from Earth — so they're also pinning their hopes on NASA's Europa Clipper mission due to launch in the 2020s. The research is described in a paper posted to the preprint site arxiv.org on Aug. 21 and accepted for publication by The Astronomical Journal.